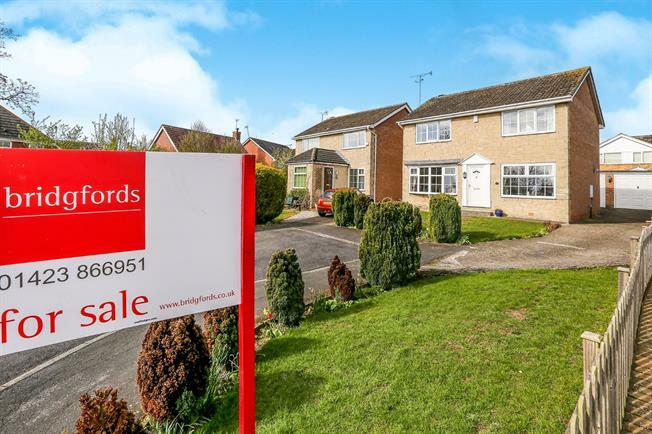 4 Bedroom Detached House For Sale in Knaresborough for Asking Price £325,000. OPEN DAY!! APRIL 27th 11AM - 12PM CALL 01423866951 TO BOOK VIEWING.A well maintained property with an upgraded kitchen and bathroom. Upon entering the double fronted home, you will find a wonderful dining room leading through to the modern kitchen over-looking the peaceful garden. To the other side of the hall is a pretty living room with duel aspect to both the front and rear of the property, with a downstairs toilet to the rear. The first floor boasts four bedrooms and a modern family bathroom. Externally there is a well maintained private rear garden, along with a double garage, all situated on a private cul-de-sac.